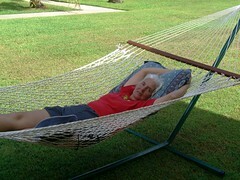 Aunt Fran has claimed the hammock for herself. Hint to her children: she’s been talking about getting one for the summer. Isn’t her birthday in March?! We would never get Mom out of the hammock !